Rizon are now releasing their 3rd CD and have made a change since they have included the singer Seraina Telli to support Matthias Götz on the vocals. It has a good effect, as the songs don't have character of being duets, but just two singers that do the vocal performances of the band in all the songs. It gives a good effect to have both male and female voices on the album. 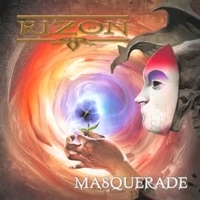 We get traditional power metal without complicated issues, and I like that a song can be simple and still have enough power and melodic structure to give a good and reliable stamp from Rizon. Some of their music is standard metal where the surprises and quality are hard to find, but apart from that we the strong and powerful Tears Of The Sun, a metal opus with inspiration from Manowar in how they build up the song. Masquerade also has the strong metal weaved into the song and a good hard rhythm to give the song more depth. Sign From Eternity delivers melodic power metal and Seraina Telli do most of the singing, and she is sharper in the vocals than Matthias Götz so the song is much more tight. Rise On has standard metal level but gets faster and more powerful as the song develops, and could absolutely be included among the best songs on the Masquerade album.